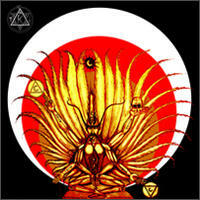 The magickian IC continues his path as the second opus is presented with a theme of Luciferian alchemy. With a better production and live drummer the essence of IC REX surpasses even the magnificent debut, still continuing in the same vein of raw yet symphonical highly Satanic Black Metal excellence! An experience of the darker domain with a soulpiercing atmosphere!